In the year 2010 a crack commando unit was accused of a crime they didn't commit… oops, sorry wrong movie. But the fact remains that The Losers is unmistakably A-Team-esque, and with both this and an A-Team movie come out this summer, it will be interesting to see which one comes out as the “better movie.” On its own The Losers sets the bar high for mindless action-adventure. If you can check your brain at the door, you’ll have a fun time at the movies. In fact, this movie is one of the most perfect versions of a video game team deathmatch committed to celluloid that I’ve seen… filled with action and witty one liners. The film follows a crack commando unit… uh… a military squad that has been hired to locate a target in Bolivia. After they are accused of murdering orphans and assumed dead, they hide in the South American underground. When an unknown contact finds them and hires them, they take the job to stop Max (Jason Patric), the man who both double crossed them and is wanted by this operative. The movie then follows the Losers as they attempt to reenter the United States and take down Max. Max is some sort of corporate fat-cat who has the CIA and other US Government agencies in his pockets, and wishes to manufacture war for profit… but this isn’t a Micheal Moore message film. Any political subtext is just to add a “flavor” to the film, more so than any intentional and direct, pointed commentary by the filmmakers. The original comic may be a little more pointed, and the political subtext here may be residue from it, whittled down to be palatable to the mainstream. The colors of the film are bright and pop most of the movie and the film has various throwbacks to its comic book origins. The film will use various techniques to emulate a comic book panel, such as using freeze frame, animating character intros and using unique establishing shot title cards when being introduced to a new locale. 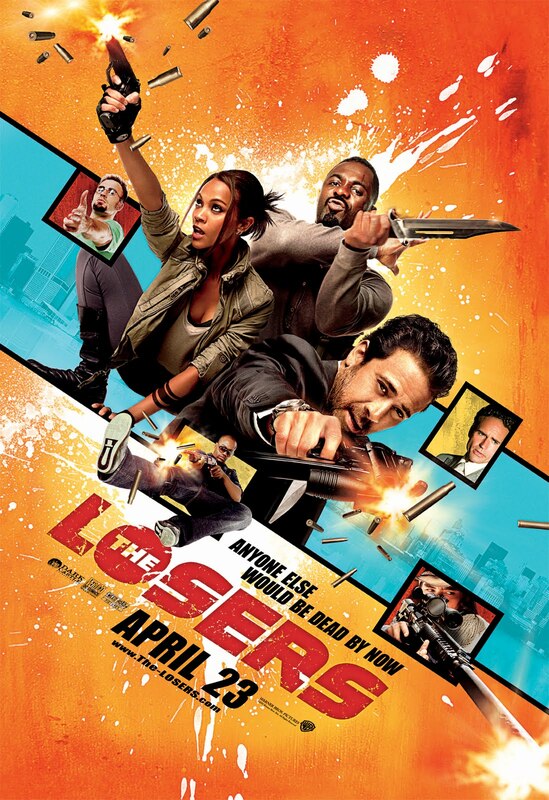 This Losers is recommended to anyone looking for a popcorn action flick. I was pleasantly surprised by the film as it managed to keep a brisk pace, crisp visuals and fun action. Of course, there are a few problems with the film, the misogyny could have been kept in check a little and some of the stunt pieces seem like they were designed by Rube Goldberg, but overall it was a fun action film. The film stars Chris Evans (Snowpiercer), Zoe Saldana (Vantage Point, Star Trek), Jason Patric and Jeffery Dean Morgan (Watchmen).